Kirsten is a Nord publican and the innkeeper at the Goodwill Inn in Bleaker's Way. 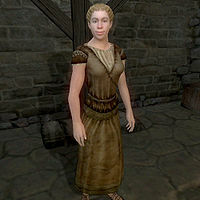 She sells various beverages and food and is a member of the Ulfgar family in town. Like most innkeepers in smaller villages, she lives a peaceful existence without much happening, except the occasional customer every now and then. She offers her services every day, except when she's sleeping on the bedroll behind the counter between 2am and 6am. The exception to this schedule occurs when she, along with the other residents of the town, join in massed combat at the end of Mephala's quest. If she survives she will go back to the inn afterwards. She wields an iron dagger and her wardrobe consist of a pair of belted braies, a belted vest as well as a pair of sandals. She also carries a small amount of gold. Kirsten is one of the few leveled merchants in the game, causing her to gain 1.5 points of Mercantile skill each time her level increases. Therefore, her Mercantile skill at any point in the game will be 30+(PC-1)*1.5. If you plan to invest in every store in Cyrodiil (for the purpose of 100% game completion), it's a very good idea to do it before finishing the related quest, or ensure that it is completed successfully. Even if Kirsten survives the battle, you will be unable to trade or invest with her afterwards if the quest is failed.